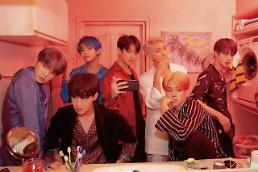 SEOUL -- K-pop boy band BTS released a teaser clip for "Boy With Luv", the seven-member group's new album song featuring American singer-songwriter Halsey. it came before the group left for the United States to participate in Night Live (SNL), a popular American late-night TV variety show. 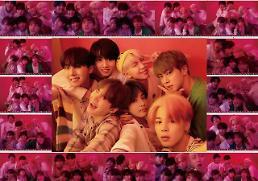 "Boy With Luv" is the title song of BTS' upcoming album "Map of Soul: Persona", scheduled for release on April 12. The boys released the first teaser for their title song on Monday and the second teaser clip was uploaded onto YouTube at midnight Wednesday (1500 GMT). As of 11:00 a.m., the video was watched 10,136,043 times. In the teaser video, BTS members dance on a stage like the ones commonly seen in Broadway musicals and inside a lobby which is also similar to those of musical halls'. The YouTube video also has garnered more than 200,000 supporting comments from fans. "I'm a blink but I have watched this many times! Excited for the comeback. Ayieeee﻿!" said Summer Kim, a YouTube user. Another YouTuber Alyssa Worsham said: "Ive been coming back here every hour and I can’t stop. IM HYPEEEEEEE﻿"